Earthling: one that inhibits the Earth. Speciesism: a prejudice or attitude of bias in favour of the interests of members of one's own species and against those of member of other species. Comparing the racism and sexism Earthlings draws acute parallels with speciesism. It's not pretty but when it is so simply resented the point is unavoidable. We are a dominant force us humans and think we own the lot - the earth's resources, all it's animals and one another. "The smugness with which man could do with other species as he pleased exemplify the most extreme racist theories. The Principle that might is right." 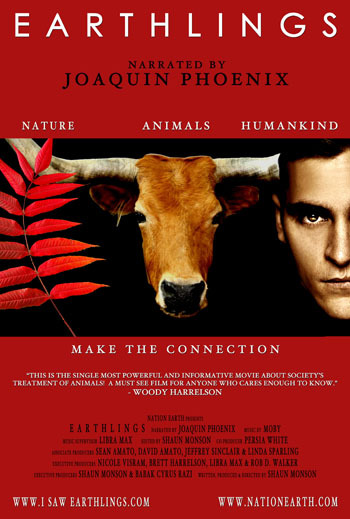 Five years in the making, Earthlings is a full-length feature film narrated by Academy Award nominee Joaquin Phoenix. It opens up the darkest facets of the animal-human relationship. Joaquin's calm, straight voice and the Moby heavy soundtrack this film is uncomfortable to watch. It is intense and is not for the faint hearted but if brutal truth is what you're after then this documentary will rinse you of your animal consuming innocence. Every major animal-related issue is addressed in this film: pets, food, clothing, entertainment and scientific research. ‘It is said that if we all had to kill our own meat we would all be vegetarians.' This movie will just about do it for anyone I'm guessing so watch this at your own risk. It's a powerful film. We're all in it together, we just don't all think we are. This film thinks we are. If you'd like to watch Earthlings click here.